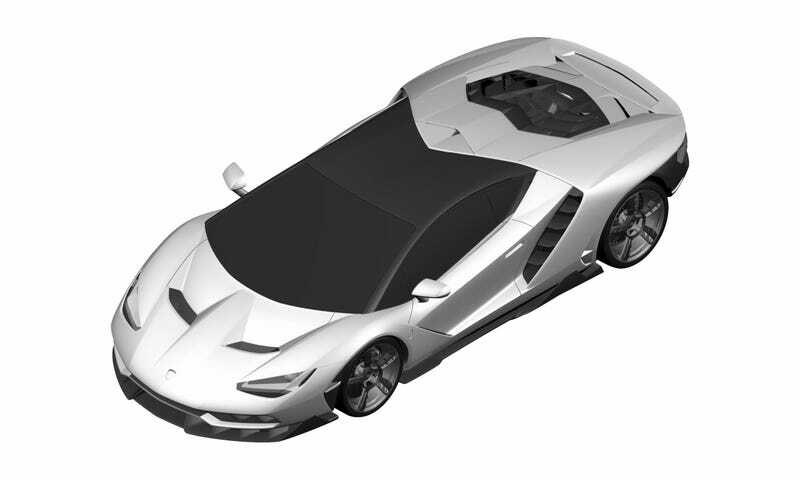 Do These Horrible Patent Images Show The Million Dollar Lamborghini Centenario? Images of a design patent made by Lamborghini back in October were published today, and they most likely show the brand’s upcoming super-exclusive supercar, reportedly branded the Centenario. Does it look fast? Yes. Does it look horribly misshapen? Also yes. I don’t know what the hell is up here, but this car, while definitely exhibiting Lamborghini’s current design language, looks to either be a flattened and stretched Lamborghini Huracan, or so fast all of the vehicle’s mass was forced towards the back of the car. There is just way too much going on around the back wheels. Obviously the car is shaped to be aerodynamic, and a lot of the space behind the cockpit is there to likely fit a massive V12 good for enough power to set itself on fire. But I still think there’s an ocean of ugly once we move beyond the door. Maybe they’ve developed a super-thick firewall. If this is the super-exclusive supercar from Lamborghini we’ve heard about before, then we know it was shown off to a private group of Lamborghini owners and persons of interest at Pebble Beach last year in the form of a hologram. It’s also been reported that Lamborghini plans to sell or has already sold only 20 of the new super-duper car for a price figure well north of a million bucks. Autoguide reports that the car will come with more than 750 hp from the same 6.5 liter V12 used in the Aventador, with the new car being called the Centenario LP770-4. They also report that the car will sit on a stretched Huracan platform. See, I told you! It’s just a stretched out Huracan, and it looks atrocious from every angle. I can say this because I will never worry about owning one. Happy 100th Lamborghini! You made an ugly supercar, refuse to go hybrid, and are selling out with an SUV. Stay crazy.